The word is out. People are leaving the US in droves. The latest FBI NICS list of American citizens who have expatriated shows a spike in individuals who have renounced their US citizenship. The list, published quarterly, provides a grand total of 2,193 such renunciants since the end of last year. 2013 resulted in a total of 2,999 renunciants, which constituted a 221% increase over those who left in 2012. And we are just half way through 2014. The NICS list, however, appears to be incomplete. For starters, NICS only lists renunciants, not relinquishers. And yes, there is a difference. Renouncing requires swearing an oath in front of an official of the US government and now has a $2,350 fee attached to it, a recent increase of 422%. Relinquishing does not require the involvement of a US government official but instead involves making one of a number of acts which result in forfeiting one’s US citizenship. As reported in the Isaac Brock Society, the ratio has generally been 4-5 relinquishers for every six renunciants, which would suggest that possibly as many as 4000 Americans gave up their citizenship so far this year. Strangely, there are many missing names in the published report, as the above article details. Given this factor, the published totals must be taken with a grain of salt. In addition, the list does not include those who have left the US for greener pastures abroad, but have not give up their US citizenship. The US professes not to maintain a list of such individuals. Recent estimates report about 6 million Americans living abroad. Other resources state that around 150,000 Americans are leaving the US each month. With the passage of FATCA, there is more initiative for those leaving to also renounce. FATCA, which came into effect this year, mandates that foreign banks report their US account holders to the US government. In light of this, many countries are now declining to open new accounts for American citizens. There have also been reports of foreign banks closing accounts held by Americans. The financial incentive is being played up by some sectors of the press. As many Americans living and working abroad face the dilemma of having to pay two sets of income tax, one to the US and one to their host country, renunciation looks better all the time. However, the economic incentive is only one factor in the decision to renounce. In a recent article, Jeff Fonseca lists a plethora of reasons for leaving, mainly of a political nature. He cites the increased police state activity, declaring that “everything is illegal,” as well as the escalating prison population, mostly incarcerated for drug offenses. “There are more Americans in jail than there were in Stalin’s Gulag Archipelago,” he notes. He also cites the breakdown of the rule of law as another reason, evidenced by the increasing incidence of judicial imperialism. Fonseca also references the concern that American citizens are now being assassinated by executive order, via drone attack. Unaffordable education costs and poor health care are also often cited as reasons for leaving. 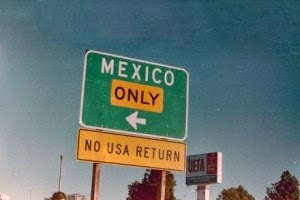 A recent Huffington Live broadcast reported that more people are leaving the US for Mexico than the opposite. Despite the continued pulse of news stories about the dangerousness of Mexico, Americans are finding that life South of the border is agreeable for a number of reasons. Retirees find that their money goes a lot further in Mexico than in the US. According to the Huffington Post, over 356,000 Americans moved to Mexico between 2005-2010. There are those who cannot leave, however. Anyone who owes back child support is routinely denied a US passport. IRS access to Border Patrol databases allows a revenue agent to issue a red flag, which may trip up someone trying to leave who has IRS issues. Provisions in Senate Bill 1813 would allow the federal government to block anyone owing back taxes from leaving the US. The bill passed in the Senate but not in the House. The “no- fly” list presents other obstacles for leaving the USA. Around 20,000 names grace this list, which details who is not allowed to board a commercial airplane to leave or enter the US. Multiple errors in maintaining this list have resulted in children being blocked from flying, as well as active members of the military. US Senate Intelligence Committee Chairwoman Dianne Feinstein has stated that “The no-fly list itself is one of our best lines of defense.” Numerous lawsuits have been filed contesting the no-fly list. The exit tax is another potential blockade for people wishing to expatriate. When you relinquish your US citizenship you may be required to pay an “exit tax.” That exit tax may add up to the equivalent of a staggering 30% of your assets. In addition, while Social Security and Social Security disability recipients may reside outside the US, those receiving other forms of assistance, such as SSI, may not. It does appear that, as the old slogan stated, “Uncle Sam Wants You!” Those set on divorcing the US, whether through renunciation or simply by packing up and leaving, are finding a number of obstacles awaiting them. Gone are the days when one could pile into the station wagon and set off to cross borders in search of a new way of life. The increasing number of regulations and financial blocks are serving as an inhibition at the very juncture that leaving the US is becoming increasingly desirable. Janet C. Phelan, investigative journalist and human rights defender that has traveled pretty extensively over the Asian region, an author of a tell-all book EXILE, exclusively for the online magazine “New Eastern Outlook” where this first appeared.